Chevy Chase is the name of both a town and an unincorporated in Montgomery County, Maryland. In addition, a number of villages in the same area of Montgomery County include "Chevy Chase" in their names. These villages, the town, and the CDP share a common history and together form a larger community colloquially referred to as "Chevy Chase." This community is roughly centered on Connecticut Avenue north of the District of Columbia and also includes a neighborhood of Washington, D.C., called Chevy Chase, D.C. Since the 1940's, when the move to the "suburbs" started, Chevy Chase, Maryland and D.C have been favorite neighborhoods for the folks who want to be close to the district. Some of the Chevy Chase neighborhoods are Martins Addition, The Hamlet, Kenwood, Friendship Heights, Somerset, and Chevy Chase Lake, and Chevy Chase Village. To search for homes, click on this link. Primarily a residential suburb, Chevy Chase also is near a popular shopping district, Friendship Heights, featuring several malls and a variety of shops and restaurants. Chevy Chase is home to the National 4-H Center, where the National Science Bowl is held in late April or early May. 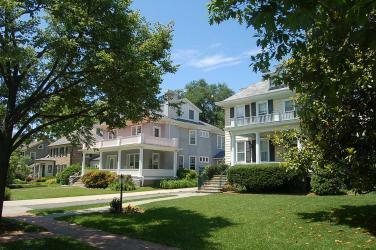 Chevy Chase oozes with charm and privacy while it is bordered by extraordinary shopping, recreation, and parks. It even has horseback riding stables! Chevy Chase is served by the Montgomery County School District. Visit the school reports on our website. To view properties in Chevy Chase, Maryland, click here. Chevy Chase, D.C is the neighborhood generally agreed to be bounded by Rock Creek Park on the east, Western Avenue (which divides D.C. and Maryland) and Tennyson Street on the north, and Reno Road to the west. Opinions differ on the southern boundary, where Chevy Chase meets Forest Hills, but many residents consider it to be Broad Branch Road between 32nd and 27th streets. The main roads leading in and out of Chevy Chase DC are Connecticut Avenue, Nebraska Avenue, Reno Road, Military Road and Western Avenue. The area is served by the M4, L1, L2, L4 E2, E3, E4 and E6 Metrobus lines. Chevy Chase is within walking distance of three Red Line stations: Van Ness-UDC, Tenleytown-AU, andFriendship Heights. The public schools that serve Chevy Chase are Lafayette Elementary, Ben W. Murch Elementary, Alice Deal Middle School, and Woodrow Wilson Senior High. Chevy Chase, D.C. also is a beautiful neighborhood with streets showing off the classic Colonial, Federal, and Victorian single family and attached row homes of all ages. It is truly an eclectic array of lovely homes in all price ranges and convenient to downtown D.C. For more information, contact Damian.